How do you like your brownies: fudgy or cakey? I fall squarely in the fudgy camp. I like walnuts in my brownies. Hold the icing. And they should taste rich, dark and chocolaty—but not too sweet. 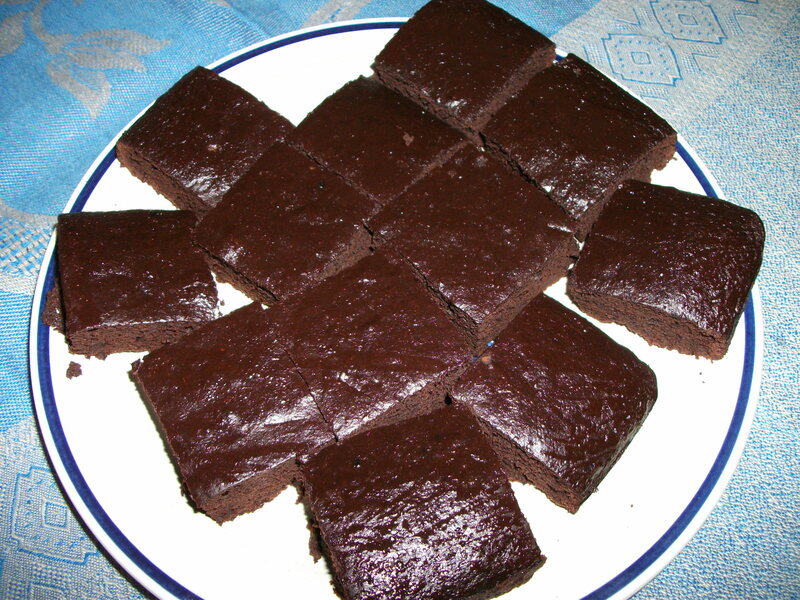 A fudgy-type brownie is what I buy at a bakery or at the farmers’ market, where purposeful ignorance is bliss. At home, however, I’ll always end up baking those cakey-type brownies that I would never buy—the ones that that call for unsweetened cocoa and oil (instead of butter). One is Lazy Baker Syndrome: I simply don’t want to fuss with melting chocolate, etc., in a double boiler. Two: when I actually see a fudgy-type brownie recipe, I can’t justify packing artery-clogging amounts of butter, eggs and sugar into a dessert that, well—let’s face it—will be demolished in one (or two, max) sitting. And, three, it’s the tastiest way to enjoy cocoa. For home-baked brownies, I always use 100% unsweetened Valrhona cocoa. Dark chocolate gets all the glory for its healthful attributes, but unsweetened cocoa is no slacker. It boasts an abundance of antioxidants, vitamins, including A, Bs, C and E, and flavonoids, plant compounds found in fruits, vegetables, tea and red wine, that can help reduce the risk of heart disease and cancer. Unsweetened cocoa is also an excellent source of iron and calcium: one 40g serving (apx 1/2 cup) of Valrhona’s unsweetened cocoa meets 6% of the DV for calcium and 85% for iron; it’s high in dietary fiber (12g) and protein (10g) and low in sugars (2g). When I invited my friend Emily over for a Sunday lunch of roast Cornish hens, braised kale, roasted cauliflower and a hearts of romaine salad, I knew that I would be serving brownies for dessert. The question was: what kind? The answer came to me as I perused The Ultimate Brownie Book by Bruce Weinstein and Mark Scarbrough: Applesauce Brownies. Hmmm…..how would they turn out? Two women. A pan of brownies. Leftovers?! Preheat oven to 350° F. Use canola oil to grease a 9-inch square baking pan. Set aside. In a large bowl, whisk together sugar, flour, sifted cocoa powder, baking powder, baking soda and salt until well combined. Set aside. In a second large bowl, whisk egg whites until foamy, about 1 minute; Stir in the applesauce and vanilla until uniform and smooth. With a large spatula, fold the applesauce mixture into the flour mixture just l combined. Do not beat. Pour the batter into the pan. Bake for 24 minutes, or until a sharp knife come out clean. Set the pan on a wire rack to cool for at least 30 minutes. Cut the brownies into 16 square while they’re in the pan. Carefully remove with an offset spatula. Serve immediately. Or, let cool completely before covering with plastic wrap for storage at room temperature. They will stay fresh up to 4 days. 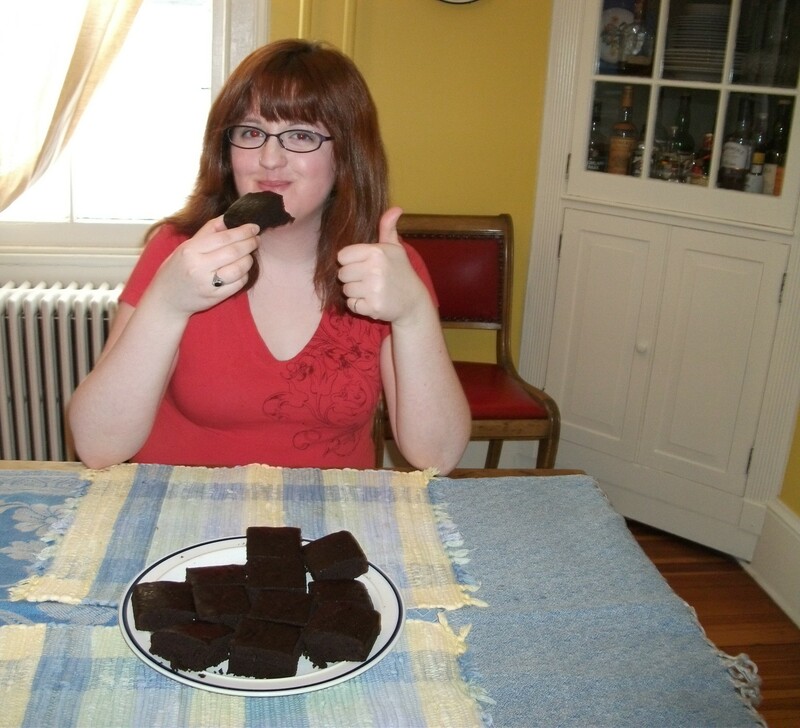 The brownies can also be tightly wrapped in wax paper, sealed in a freezer safe bag, and frozen for up to 3 months. Allow them to thaw at room temp before serving. This entry was posted in Food, Health, Home Baking and tagged brownies, chocolate, cocoa, unsweeteend cocoa, Valrhona. Bookmark the permalink. this was the first brownie recipe i have ever tried in MY LIFE. let me tell you they were GREAT. i’m pretty sure this will be the only brownie recipe i will be using now!!! Thanks, Sarah! Glad you enjoyed them. We think they’re delicious, too!